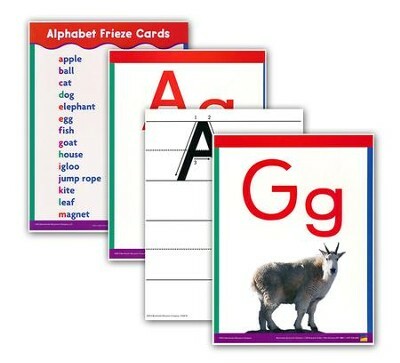 This set of alphabet Frieze Cards features a 8.25" x 10.25" card for each letter of the alphabet that shows the upper-case and lower-case letter as well as a picture of an item that starts with that letter. The back of each card features the upper and lower-case letters with tracing instructions and lines to practice handwriting. Both sides are laminated to write-on, wipe-off. I'm the author/artist and I want to review Alphabet Frieze Cards.